Yesterday morning I met up with my friends Alex Wetmore and Mark Vande Kamp for a bit of riding and conversation. Alex and I are both tinkerers who like folding bikes and the day's excuse for a ride was to compare our respective machines. Alex's Bike Friday Tikit features a front rack that he'd just finished brazing up a few hours before our ride. It only takes about ten seconds to fold the Tikit, which is even faster than the 30 seconds or so it takes me to fold my Dahon. Folded, the Tikit is a bigger package. If Alex used flat bars, the bike would fold into a smaller package but it would still be bigger than the Dahon D3. I was surprised at how flexy the front end of the Tikit felt something both Alex and Mark commented on as well. Pretty much every folding bike I've ever owned or ridden has had some degree of front end flex, but the Dahon feels much more solid than the Tikit. The Tikit has an astoundingly clever folding mechanism -- folding the rear triangle untensions cables that release the stem locking mechanism. The bike has a little handle that lets it roll when folded. Both Alex and Mark were impressed (as I continue to be) at the quality of the Dahon D3. It's a very nice bike, quite amazing considering it sells for just a bit under $400. 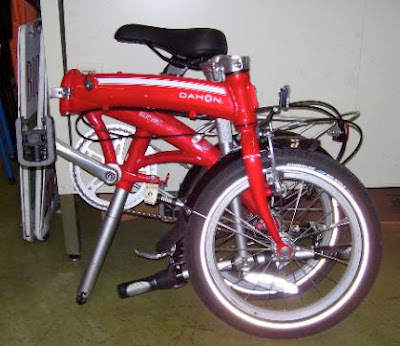 A made-in-Oregon Tikit costs about 3 times what the made-in-China Dahon does. The Tikit has many more fitting options than the D3. At 5'6" and 140 lbs, I fit fine on the D3 but I don't think it's the right bike for larger folks, although Dahon makes a wide range of bigger bikes as well. The rear tire on Alex's Tikit was low on air, so he got to use the Dahon's seatpost pump to top out his tire. The pump works surprisingly well although Alex did say that it was "the weirdest pump I've ever used." After breakfast at Pert's Deli, we rode north along Lake Washington, through the Arboretum and into Freemont to visit Folding Bikes West, the place in Seattle where you can see Birdy. Brompton, Dahon, Giant Halfway and Tikits all side by side. They all have a certain appeal but the Bromptons still seem to be the most evolved. If you have way more money than Alex, Mark or I do, you can even get a Brompton with lots of clever and light bits of titanium. Alex's take on the day is here. I've been an undriver for years, and thanks to the folks at Sustainable Ballard, now I'm official! "...where is the enjoyment? Where is the part where you ride up a mountain with friends, looking forward to another beautiful day? Where is the place where you hang out with your friends at dinner, reminiscing with your companions? The book has no place for them. You are encouraged to ride alone as much as possible, lest your competitive instincts take over and you work too hard. Or perhaps your companionable instincts take over and you work too little. No wonder the serious cyclists I meet never ask if I want to go for a ride!" I guess I'm lucky to have friends like Mark Vande Kamp and Matt Newlin, guys who think getting up before the sun is a good idea, who load up on a fatty breakfast at 7:00 AM when the Twin Eagles Cafe opens up in Snohomish and then roll north into the mountains. Our plan is vague, as is our custom, and Mark's hand-drawn map is only a suggestion. The ranger station at Verlot has more details -- a map and photos of the various washed-out roads. Matt has never been to the ghost town of Monte Cristo and that turns out to be the deciding factor. So it's 183 junk miles spread over a couple of days. A little bit of hike-a-bike around some rock slides, the fording of a small river, a hike around the ruins and up into the glacial basin, dinners cooked back at camp and solving the problems of the world until darkness reminds us all it's time to sleep. Sunday's investment in slow climbing returns miles of coasting on Monday. It's important to have goals and one of my goals is to make sure I always have time for junk miles. The City of Seattle's Climate Protection Initiative was born in February 2005 when Mayor Greg Nickels pledged that Seattle -- the entire community not just City government -- would meet or beat the United States' target of the Kyoto Treaty: reducing greenhouse gas (GHG) emissions to 7 percent below 1990 levels by 2012. Unlike some other politicians, Mayor Nickels and his crew recognize that bicycles are a valid and valuable component of our transportation system. On Saturday, September 22, 2007, folks from Seattle CAN, the Bicycle Alliance of Washington, the Bikery, Bike Works, and the Cascade Bicycle Club Education Foundation all got together in the Columbia City neighborhood of Seattle to provide some hands-on help and information to aid people in their efforts to reduce their carbon footprints and increase their use of bicycles. Tutta Bella, a very environmentally-conscious local restaurant, provided coffee and pastries and one of their people talked about environmental initiatives within their business. Dara Ayres, Bike Works Executive Director spoke briefly and introduced me and I, in turn, spoke briefly and introduced Mayor Nichols. The mayor spoke about how Seattle as a city and how Seattle-ites as individuals are making a difference. The most impressive thing to me was not just that the mayor spoke, he listened. He didn't just stay for a photo-op, he chatted with various bike commuters and volunteers. We didn't have a lot of lead time to put this event together or to get the word out. Dara and her crew were literally making signs the day of the event but it all came together nicely. It was a fun day and maybe we made a little bit of a difference. Last month I wrote about my amazing luck involving a nail in my tire. Yesterday morning, I had a similar, yet different experience on my ride in to work. Now, I'd been meaning to get a spare tube for my new little Dahon, but I hadn't actually gotten to the point of purchasing a 16" tube. Now I wasn't totally tempting fate, I was carrying a patch kit. But sometimes that's not enough. So, in the small hours of Thursday morning I'm headed to work and Blammo!, I run over something. A drywall screw to be precise. My rear tire is instantly flatter than an Edward A. Abbot novel . I coast to a stop and survey the damage. Rather than fix the flat there on the roadside, I roll the bike over to the nearest bus stop, fold up the bike and hop the next bus into Seattle. I figured I'd patch the tube at the office. Now here is how the world works. If one time, you get away with running over a nail and your tire does not go flat, sometime, within the next month, things will balance out. That stupid little screw punched a couple of holes in my tube, shredded the rim-strip. In my brief little roll to a stop at least a dozen little micro-pinch-flats formed in the tube. I used 11 patches and still had air leaking out of some tiny holes. And we were out of patches at the Bikestation and we didn't have any 16 inch tubes in stock. Luckily my buddy Brad stopped by and he said he was heading by a bike shop anyway and he'd be happy to pick me up a tube or two and some patches. I gave Brad the cash for 3 tubes and a patch kit. It pays to be prepared. And even when you're not prepared, it sure helps to have friends. Without Brad, I would've been really screwed. If you own a Dahon D3 (or pretty much any other folding bike) you will have strangers talk to you about it at the bus stop. And on the bus. And when you get off the bus. And when you are stopped at stop lights. And at other random places. People you don't know will stop and take pictures. 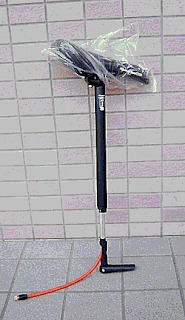 Do not get a Dahon D3 if you are shy. 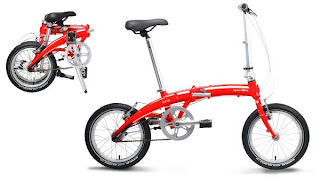 If you buy a Dahon D3 and you are married, your wife will roll her eyes and say "not another bike!" When she sees it, she will say, "well, it is pretty cute" and "at least it doesn't take up much space." 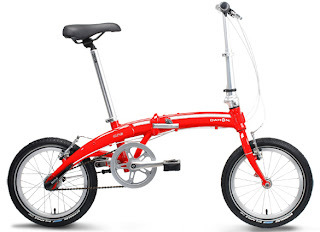 It's almost impossible not to feel like a circus bear when you ride a Dahon D3. It's also almost impossible to keep a silly grin off your face as you ride it. 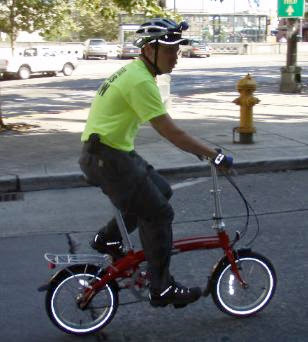 If you have a folding bike, your buddies will say "so how fast does it fold? ", click the stopwatch function on their watches and say "go!" You will get faster with practice. I've had the bike a couple of days and I've got the fold speed down to about thirty seconds. I think 15 seconds is possible. The Dahon D3 is surprisingly zippy. Well, zippy enough for a guy who isn't that zippy. My normal 18 mile each way commute takes me about an hour and half on my green bike. On the Dahon, the commute times have been about an hour twenty six. BTW, I don't have a speedometer on the D3 but I've had it up to plentysix miles per hour on some steep descents. Sometimes I feel like I waste too much time on the internet, reading forums and browsing blogs. And then sometimes I come across a really good rant, like this one from John Laidlaw. 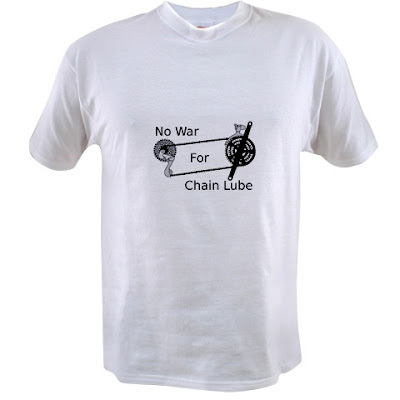 The original topic was chain lube but John points out that understanding how to maintain a bicycle is not just about a bunch of gears and chain. Subject: Re: [BOB] Chain lube. Well, speaking from experience - it was my own bike, and if I wanted to ride it, I either had to pay to get it fixed, or fix it myself. Given the state of my exchequer, the latter was the preferred option. I managed to get through into my twenties, before i had a prang that damaged my frame (a "door-prize"), and into my forties before I started bending wheels occasionally. I'd say that a teenager, given the incentive CAN learn to fix things himself. Too often what happens is that a parent will come along, and say:"That's too difficult for him to do." and take over, or give it to an "expert" (Possibly the same age, but paid to do it). What does the youth learn? That the only way to get something done is to hire an expert. That, never, but never, is he or she to learn to do the job himself. It's a recipe for over-weight, under-achieving, dissatisfied, immature adults - just what we see all around us. It leads (just look at the statistics) to treating everything as "replaceable" - if your marriage, your job, your friendships are getting too hard to deal with - just junk 'em, and get new ones. They are bound to be perfect. On the other hand, if you've learned to do your own maintenance, then you think in terms of maintenance in all things, including relationships. You learn to ask if it is possible that you are doing something wrong, yourself. When that happens, then there is a chance of getting things properly fixed, for you are starting at the right end. Oops - that rant got away on me. But fixing your own bike, and teaching our youth to do the same thing, is a powerful paradigm for living a life. Seattle is a pretty darn nice town for cycling and it's got some pretty cool bike shops. 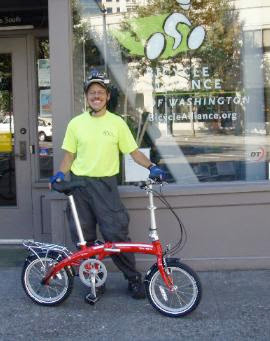 This week, I stopped by Folding Bikes West in the Freemont neighborhood to take a look around and test ride a Dahon Curve. Folding Bikes West shares store space, staff and DNA with Electric Bikes Northwest but I didn't really spend any time looking at or taking pictures of the electric bikes. I probably should go back and take some pictures of those and also ask the question that's been bugging me: why does one company have the modifier "West" and the other "Northwest"? Folding Bikes West has a lot of bikes in a pretty small space. I guess this makes sense, one of the neat things about folding bikes is that they don't take up much space. In one small storefront (half of which is occupied by electric bikes) I got to see Giant, Brompton, Dahon, Bike Friday and Birdy folding bikes. The various bikes are available for test riding. I've ridden (and owned) various folding bikes over the years and I was short on time, so I only test rode the one bike I'd really come to see, the Dahon D3. The demo D3 pictured below has an optional front basket but the rest of the accessories (fenders, kickstand, rear rack and seatpost pump) are stock on the $395 Curve D3. Since I have a pretty good background with folders, I was used to the zippy feel of the little wheels. The 2" wide Schwalbe Big Apple tires seem to really hit the sweet-spot in terms of speed and comfort, tough enough to soak up the rough pavement without feeling sluggish. A lot of folks might wish for more gears or a wider range than what is provided by the D3's Sturmey Archer hub, but since I come from the "do more with less" school of thought, I found the 3 gear ratios (42"/56"/77") totally adequate. The D3 folds quickly into a pretty compact package. Even fumbling around the first time, I was able to fold it in about a minute and the folded package is compact and well-balanced. A little package that would fit easily onto the bus. I returned from my 20 minute test ride with the words "I'll take one." Bike Works, Cascade Bicycle Club, the Bicycle Alliance, the Bikery and Tutta Bella Restaurant are pleased to announce a new collaboration with the City of Seattle and over seventy community partners and local businesses who are coming together to inspire concrete action on climate change. The community-wide effort, called Seattle Climate Action Now (Seattle CAN! ), invites all Seattle residents to become part of the solution to climate change by taking concrete steps to increase home energy efficiency and transportation efficiency. The campaign also provides avenues for civic engagement and collective action. The practical steps promoted in the campaign will help build a stronger, healthier community for our families today and will also help ensure a brighter tomorrow for our children and grandchildren. Come learn about climate pollution reduction and how biking more and driving less can be better for you and the planet. You can learn about bike maintenance, find out about how to get started in bike commuting, how to fit a bike and a helmet, figure out the best routes to ride, get local bike maps, learn about combined bike & bus commutes, and much more. Join us for food, fun and refreshments and enter a raffle to win a free bike! Community events designed to help Seattle residents increase home energy efficiency (fall-winter emphasis) and reduce transportation emissions (spring-summer emphasis). Home energy and transportation are Seattle's two largest sources of climate pollution. The events will emphasize collective action, where possible, and will provide opportunities for partners to co-promote their activities and resources. Bike Works, Cascade Bicycle Club, the Bicycle Alliance and the Bikery will continue to look for ways to engage our members throughout this year-long campaign and your input is vital. Contact us if you would like to help plan future events and activities. Working together, Seattle CAN make a difference! I really like the looks of this little bike. First off, it's red. Second, it folds into a pretty tiny package. Not quite as tiny as a Brompton, but pretty tiny. And at $400, it costs a lot less than a Brompton. look really good. I've always liked Sturmey Archer 3-speed hubs and Schwalbe Big Apple tires. And even though the pictures don't show it, the bike comes with fenders and a rear rack. And a final bit of niftiness is that the seatpost contains a built-in tire pump. Cool, eh? Now, I've done a pretty good job of paring my bike stable down. In fact right now, my only bike is my 1987 green Gary Fisher. I don't need another bike now, do I? But maybe I'll stop by Folding Bikes West this week just to check out the shop. What could it hurt? 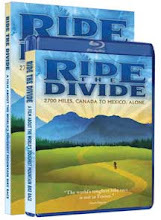 p. 22 -- Less than 1% of work trips in the U.S. are by bicycle. p. 34 -- Walking makes up 8.7% of all trips in the U.S.
p. 35 -- Walking makes up 2.5% of all trips to work. p. 50 -- State spend 1.54% of their Federal Transportation dollars for bicycle and pedestrian projects on average. This amounts to $2.52 per capita each year on average. 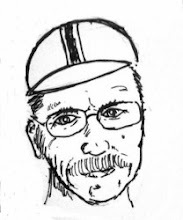 p. 85 -- Weather is not a major factor influencing cycling levels. p. 86 -- Denser cities have higher rates of cycling and walking. p. 88 -- Cities with higher rates of cycling and walking have lower car ownership rates. p. 89 -- Cities with more bike facilities have higher cycling levels. p. 90 -- Many studies now show that bicycling safety increases greatly as cycling levels rise. p. 91 -- States with higher levels of walking have lower rates of pedestrian fatalities. p. 95 -- States with higher levels of biking and walking have lower levels of obesity. p. 97 -- States with higher levels of biking and walking average lower levels of high blood pressure. p. 98 -- Diabetes rates are lowest among states with high levels of biking and walking. p. 100 -- 3.4% of trips to work in the U.S. are by bike or foot; 9.6% of all trips in the U.S. are by bike or foot. p. 101 -- 12.9% of U.S. traffic fatalities are bicyclists and pedestrians; 1.5% of U.S. transportation dollars go to bicycling and walking. I guess the Accelerade people are trying to generate some internet buzz. They wrote me (and gosh knows how many other bloggers) saying basically "hey we've got a beverage, we'd like to to try it and maybe write about it." They said "we'll send you a one-month supply, 30 bottles. No charge." I thought, "I can drink a hell of a lot more than 30 bottles in a month" but that "no charge" line caught my attention and I said "sure." and you can read all about how their drink is much better than a carb-only drink. How it's better for endurance, better for recovery, etc. You can read about how people who are faster than you or folks who run or ride farther love this stuff. And you may think, "Wow, that's some cool stuff." So I got my case of the stuff, 30 bottles total in four different flavors: Fruit Punch, Mountain Berry, Peach Mango and Citrus Grapefruit. They even sent me an Accelerade t-shirt. Their marketing campaign was perfect. They just forgot one thing. One important thing. I try to practice the "if you can't say something nice, don't say anything at all" principle but these folks sort of forced my hand. They sent me the stuff, they wanted me to talk about it. If I stick to the "if you can't say something nice..." principle, this is going to be a short review. Now in theory you could make a carb+protein drink by taking something like a trout and running it through a blender with some orange juice. This would probably taste better than Accelerade. I think the protein is the problem, it gives the drink a very nasty under & after taste. At first I thought it was just one flavor, so I tried them all. I'm tempted to say the Citrus Grapefruit is best, but that's not right. The Citrus Grapefruit is the least repulsive, but it's still bad. I thought maybe it was just me, so I drafted my sons into the experiment. Their comments aren't printable here. My buddy Dave was willing to give the beverage a try. Dave is diplomatic. He took it home to try it. I asked him about it the next day. "Did you try it?" "You want any more bottles?" I tried getting really, really thirsty and coming home to very cold Accelerade right out of the fridge. If I tried very hard, I could slam down about half a bottle before the taste kicked in. Now maybe someone, somewhere likes this stuff. If that's you and you want to swing by Issaquah, I have 11 bottles of Accelerade for you. And please leave a comment telling me how wrong I am about Accelerade. I was wrong in thinking that 30 bottles of Accelerade wouldn't last me a month. I gave the experiment 6 weeks, I tried giving it away to my kids and my friend Dave and I still have 11 bottles. For me, 30 bottles is a lifetime supply. 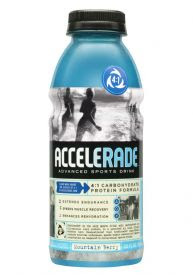 I did try to come up with a scenario where I'd voluntarily choose to drink Accelerade and I think I've come up with it. I imagine a super hot day. I've just ridden the Issaquah Alps 100K loop four times without taking a drink. I stagger home, open the fridge and see two bottles. One contains Accelerade and one contains goat urine. In that instance, I would slam down the Accelerade. I'd save the goat urine to wash the taste of Accelerade out of my mouth. Rene, Narayan, Matt, Ted and I worked the control check-points for the ride while everybody else rode it. It was a great day and even though I did get cursed a bit for my course design (the route has about twice as much climbing per kilometer as PBP, for example). Still, I think most folks enjoyed themselves. Special thanks to Sandy's Espresson in Carnation for their support. As Rodney Dangerfield would say, "It's not easy being me." It's tough, tough, I tell ya, to not go into the office on a sunny Wednesday but this weekend I'm hosting the Issaquah Alps 100K Populaire for the Seattle International Randonneurs and I had to do the final pre-ride of the course to make sure the cue sheet is right and figure out all the check-points. Mat Newlin, Narayan Krishnamoorthy and Shan Perera made the big sacrifice of joining me on the course. Somehow we persevered through relentlessly comfortable temperatures, picturesque tree-lined roads, character-building climbs, thrilling descents and an absurdly relaxing coffee shop stop. and buy one of these shirts for themselves. Berkeley Breathed tells the best version of this story in his book Red Ranger Came Calling and I don't know what the true story is. But I do know that there is an old bike, solidly embedded in a tree on Vashon Island. I've heard about it for years and this morning I'm riding with some friends to see the bike tree for ourselves. By the standards of my peer group, this is just a short trip -- no camping, less than 100 miles for the day, out from home before sunrise, back home by early afternoon. A small adventure designed to fit into lives filled with other responsibilities and projects. My pal Brad Hawkins can't shake loose enough time to go over to the island, but he meets up with Mark Vande Kamp and myself at the I-90 bridge and rides with us to west Seattle. I hope Brad's students appreciate what a responsible guy their teacher is. The bike tree is off of Vashon Highway (which runs between the Seattle and Tacoma ferry ports on either end of the island) on the northeast corner of the Vashon Highway and SW 204 St. intersection, about 50-60 ft (very rough guesstimate) into the woods on the north side of Sound Food Cafe. The directions are perfect and at 8:00 AM we are at the tree. The day and the island and the company are all wonderful. We ride the quiet, hilly roads of Vashon and Maury Islands, picnic under blue skies and ride some more. If you get tired of riding your bike on the island, then perhaps you are tired of life. The tree bike isn't the only odd thing on the island, a fleet of exercise bikes look out toward the mainland. We wander the small roads over and around and eventually back to the ferry. Burma Road makes us reach for every low gear we have and convinces each of us that we've finally done enough climbing for the day.